Colombo turns festive in December; the bracing air, lively parties, Christmas decorations, bright lights, visiting Sri Lankans in their flashy casual clothes; the nondescript city by the ocean is transformed. After months of lean sales, the big stores prosper; meeting orders for Hams, Turkey, leg of Lamb, wine, Stollen, Breudher and other rich fare. There is encouragement from the credit card companies, attractive discounts dangle before the card holder. At the more fancied restaurants, seats are difficult to find, revellers have made reservations in advance. 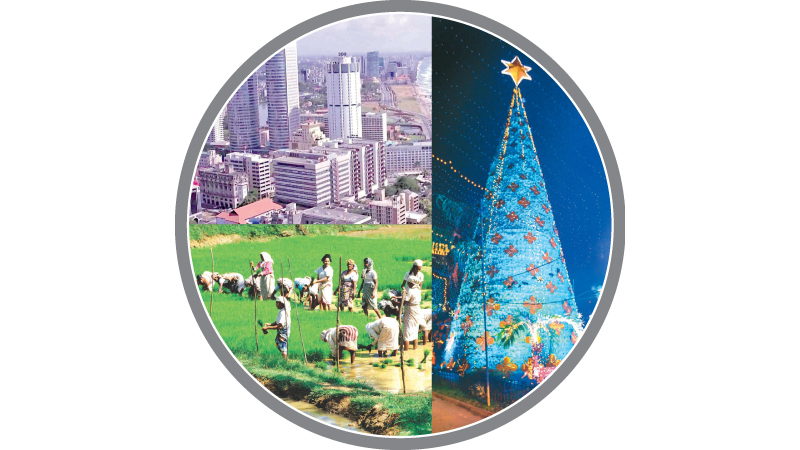 Christmas, in Colombo particularly, is no longer limited to the Christians, the festivities are enjoyed by all. Over laden tables the families gather, renew old friendships, make new friends; chat, reminisce, talk of politics, parliaments, kings and cabbages. Rasika with his parents migrated to America, in his early teens, a good two decades ago. Now he is an engineer working for a large American company supplying defence equipment to the government. Naturally, he was reluctant to talk about the details of his work, which I understood involved designing high-tech weapons. We met at the plush Shangri-La hotel, the preferred wedding venue of the local high society. When invited by Rasika’s father I mentioned that the price of drinks would be on the high side, he countered light-heartedly, “the amount of rupees that I get for my dollars now makes me feel rich”. Eager for an untried view of the famous Galle Face promenade I looked out from the hotel foyer. The landmark green seems to have contracted, one side overwhelmed by the shadowy behemoth of a Port City emerging from the sea, while the other is covered by new hotels rapidly coming up. The green proper is no longer unspoiled, dotting the length of the walk are little kiosks, selling street food; a touch of slum, challenging the five-star stretch. Right in front of the long windows of the hotel is the pharaoh like statue of SWRD Bandaranaike, one of our former Prime Ministers, famed not for advancing the economy of the country, but for still controversial social changes wrought during his four-year tenure. The figure is large, imposing; strong face, eyes gazing across the sea at the world beyond. I am told the real Bandaranaike was not anything like that, the statue is misleading. No robust sea faring man, whatever Bandaranaike may have done during his premiership, developing the Galle Face promenade was certainly not one of them. The sculptor may have wanted to convey something, a political idea, an impression of a strong visionary. Or, perhaps his only aim was to glorify the subject, at the time of installing the statue, Bandaranaike’s daughter was the President of the country. The back of the statue was towards the spanking Shangri-La, the country’s boast of attracting global hotel chains. Rasika’s parents who had become US citizens had put in their papers for dual citizenship in Sri Lanka. I asked Rasika why he had not. As an employee of a Defence oriented company his contract of employment stipulated that his allegiance was only to America and therefore could not be a dual citizen he explained. This led to a general discussion on the desirability of dual citizens holding high positions in the Sri Lankan State structure, including as members of parliament and country’s ambassadors. There was reference to the latest amendment to the Constitution prohibiting dual citizens from running for high office. “But who do they owe their allegiance to? Take the case of this Wickramasuriya, presently facing criminal charges in the US courts. What talents did he bring? Apparently he enjoys a resident status in America. But, he was also our ambassador to America. It is said the man claimed immunity from prosecution on the basis of his diplomatic status. The chap did not bring honour to this country”, countered another in the group. “That is an exceptional case. Working or studying in a foreign country is status enhancing in this country. We are proud even when we get a loan from a foreign institution. Imagine if we have a President who has been granted citizenship in the US. We may even brag about it”, said the proponent of dual citizenship while topping up his glass of whisky. Rasika’s father commented “As for my family, migrating to the US has been a boon. We enjoy a decent living standard, there are opportunities for all, the system works there. All three of my children have qualified from good universities. I am not certain what our lives would have been had we remained here” concluding light-heartedly “Entertaining friends here at the Shangri La would have been an impossibility unless I was corrupt”. For some reason my mind kept going to that Bandaranaike statue in front of the hotel; turning away from the land, gazing in a Westerly direction. His policies were said to have been inward looking. Did those policies lead to the emergence of a certain way of thinking, in a set outlook? For the generations that followed, life became small and bleak. Those who wanted a bigger and a better life, were compelled to look for greener pastures overseas. Overwhelmingly, they, including many of Bandaranaike’s progeny, have chosen the Western world, the very countries that he damned so eloquently! A few days later, I attended another Christmas gathering. This was at an old club house, proudly claiming its origin to the early 20th Century. The pioneers, the Europeans, had long left. That early history did not belong to its present members, that was another time, another way. Now only a pretense to a British tradition, clubs are places to partake drinks and food at a reasonable cost. There are no particular etiquettes to follow, except for the obligatory long trousers in the evening for the males, a mere form sake observance. Going through the names, the club committee was a gathering of commission agents, well known hustlers and corrupters. The door to respectability is open to anyone who can pay the high entrance fee. Moral obloquy requires discernment, an ill-affordable indulgence in a disintegrating society. I also noticed that in the very limited club parking, committee members had reserved parking, echoing the larger culture, a deep-going deference to office. High office, particularly political, entitles the holder to privileges, which in a society so denied, borders on the indecent. Where the members park their vehicles matters not, the officials have to attend to important matters, round the clock! Even among those of equal standing, a basic tenet of club spirit, some have become more equal. Until recently, the road that the club was situated on, had a short European name, perhaps the Governor at the time, or the engineer responsible for the road. Now it has a very long name, after a renowned religious personality. Someone mentioned the impracticality of long road names, after all, roads and residential/commercial plots need clear system and easy identification. Another in the party explained. When asked what these communities traded in, he answered confidently “rice, spices and elephant tusks”. Different grains of rice for different markets, spices aplenty, easily meeting the unbounded foreign demand. A picture was drawn of a bustling city to which travellers came from faraway lands, not only to trade, but even settled down for greater opportunities. From accomplishments in a few areas of human endeavour, achievements in all areas of civilization is assumed, a near modern State. Whatever developments that occurred in other places; in infrastructure, roads, harbours, shipping, banking, book keeping, duty and taxes there have been parallel developments here. A far cry from the confounded report of the Kings agents, hundreds of years later, on the arrival of Portuguese seafarers on our shores; embarrassing for its lack of sophistication. It was towards the end of the party that I had the most insightful chat for the evening. Anushka, a young teacher, is married to my friend Shehan, who works for a commercial establishment in the city. They lived with her parents in the outskirts of Colombo, in suburban Homagama. Conveniently, she had obtained a posting to a school near home, made easy by the fact that her subject was English, and English teachers were hard to come by. “Can the school do something for the children, how can they study in such an environment?”, I inquired.